The Shona people from Zimbabwe and are best known for their skills in sculpting the different varieties of stone found in Zimbabwe. Shona sculpture is steeped in the legend and traditions of an ancient African culture, yet stunningly modern in appearance. 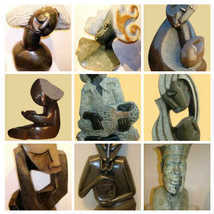 Shona sculptors, transcending geography and time, create in the living stone profound expressions of the human condition. Sculpting by hand with simple and found tools, these self-taught artists carve in indigenous serpentine, granite, and rare precious verdite. The result is a diverse body of work alive with dynamic, spiritual themes. Select pieces can be found in the permanent collections of many museums, including the Museum of Modern Art in New York, the Rodin Museum in Paris, and the London Museum of Contemporary Art. Newsweek called Shona sculpture "the most important new art form to emerge from Africa in the last hundred years," while the Economist proclaimed Shona sculptors to be the "world's best unknown artists." The first and most important step sculptors take is choosing their stone. The most popular stones used are brown, green and black serpentine, springstone, opal, verdite, leopard rock, rapoko and red jasper. Only after seeing the shape, color and size of the stone will the artist decide on the subject he will sculpt. The artist shapes the stone using a hammer, chisel, knife and rasp. The stones are finished by hand with wet sand paper and than are heated mainly with a gas flame so the polish will be easily absorbed, resulting in a long lasting finish. A white wax furniture polish or beeswax is applied immediately while the piece is still hot. Once cooled, it is shined with a soft cloth. Zimbabwe stone sculpture first began to emerge in the early sixties. Artists and small workshops of artists were encouraged by the then director of the National Art Gallery in Zimbabwe. The critics were amazed at how the indigenous people took to this art form and by the themes and ideas that inspired each piece. The sculptors soon discovered the wealth of the stones to be found in Zimbabwe's Great Dyke and moved onto harder, more difficult but more beautiful material. Out of these beginnings have risen some of the most famous names in African art history such as Nicholas Mukomberanwa, Henry Munyaradzi, Joram Mariga and many more. We are now coming up into the second and even third generation of artists from this era, and with this we see more than ever the great diversity of impressions and materials used. When sculpting rather than using sketches, the artist follows the form of the stone allowing the stone itself to dictate what subject lies within. It is a marvel to see an artist take a lifeless mass of rock, with its pale, jagged surface and mold it with their hands, mind and heart into a smooth, polished, brilliant work of art. Because of their strong ties to family and tribe, the Shona depict relationships between families and couples, both human and in the animal kingdom. In the last few decades Shona sculpture has blossomed into an internationally acclaimed hallmark of contemporary African art developing its unique style and spirituality. Each unique stone sculpture crafted by Shona artists displays great individuality of form and content. The inherent strength of the stone coupled with the marvelous fluidity and movement of the lustrous finished piece offers not only an astute investment for the collector but also an inspiration to the art enthusiast in us all. This is the true spirit of Contemporary African Art. We repair and polish Shona Sculptures and most wooden items. Call for a free quote.